Bullying affects all kids, including not only those who are bullied but also those who bully others. Everyone has control of their own actions, so sometimes it’s good to remind people to just “Don’t Be a Bully”. At the same time, speaking out can help victims of bullies feel supported and strong. Design custom silicone awareness bracelets now! 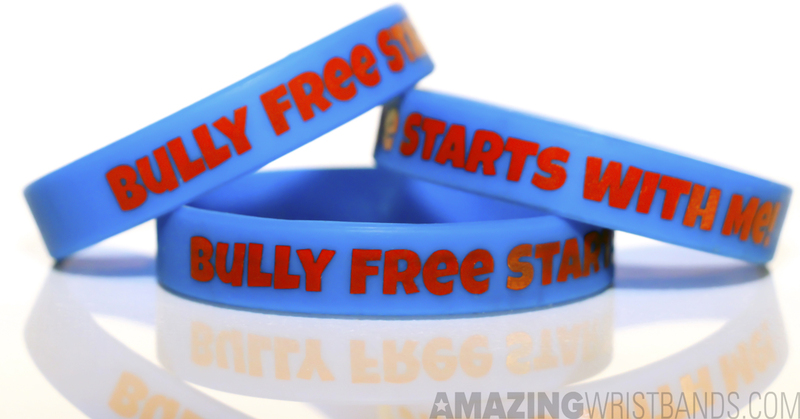 Wristbands can make any “Don’t Be a Bully” campaign stand out. Schools, church groups, teams, and other youth organizations can show solidarity for the cause through “Don’t Be a Bully” wristbands with custom design and messaging. Wristbands can come in any color and can be made with glow-in-the-dark or glitter effects, for added impact and appeal. The easiest message to add might be “Don’t Be a Bully.” Kids can see it as a reminder for how they should model their behavior, and other kids will immediately know what side of bullying they’re on. Why Buy “Don’t Be a Bully” Wristbands from Amazing Wristbands? Amazing Wristbands is a leading provider of customized silicone bracelets available online, including “Don’t Be a Bully” bracelets. Our anti-bullying rubber bracelets are comfortable, durable, and non-allergenic, made of 100% silicone. Many of our wristbands can be created with our easy-to-use online tool. In addition to standard wristbands, we also offers super popular slap bands that “snap” to a person’s wrist, as well as half-inch bands, thicker one-inch bands, adjustable bands, USB bands, silicone rings, and silicone key chains. 100% Silicone for your “Don’t Be a Bully” awareness campaign. Build your own “Don’t Be a Bully” bands online!